Ibn al-Shatir is considered to be the most distinguished Muslim astronomer of the 14th century. Born around 1305 in Damascus, Syria, Ibn al-Shatir was the head muwaqquit at the Umayyad mosque. He is responsible for the regulation of the astronomically defined times of prayer. Ibn al‐Shatir made substantial advances in the design of astronomical instruments. His biggest contribution to astronomy was his planetary theory (David A, King. http://islamsci.mcgill.ca/. September 6, 2014). A manuscript of Ibn al-Shatir. Many achievements by Arabic scientists come as a surprise. Nicolaus Copernicus relied on work carried out by Arab astronomers, such as Ibn al-Shatir, from many centuries earlier (RY, Deshpande. http://www.irfi.org/. September 6, 2014). Ibn al‐Shatir appears to have begun his work on planetary astronomy by preparing a zij, an astronomical handbook with tables (Victor Roberts. http://www.jstor.org.ezproxy.lib.ou.edu/. September 6, 2014). His work, kitab nihayat as-sul fi tashih al-usul (“A Final Inquiry Concerning the Rectification of Planetary Theory”) in treating the motion of the Moon eliminated the need for an equant (in the Ptolemaic system, a point on the opposite side of the center of the deferent from the Earth, about which the planets move at constant angular speed) by introducing an extra epicycle (in the Ptolemaic system, a small circular orbit of a body, the center of which follows a larger circle (the deferent) around Earth). (http://www.griffith.edu.au , September 6, 2014). Copernicus used al-Shatir’s numbers, but al-Shatir’s planetary theory was not even investigated until the 1950s. Ibn al-Shatir’s model for the appearances of Mercury, showing the multiplication of epicycles using the Tusi-couple, thus eliminating the Ptolemaic eccentrics and equant. Wikimedia Commons. Ibn al‐Shatir made a set of tables with the values of certain spherical astronomical functions for times of prayer. The latitude used for the tables was 34°, corresponding a place located north of Damascus. These tables display the time for morning, afternoon and evening prayers as well as standard spherical astronomical functions (http://islamsci.mcgill.ca/.). He designed and built a horizontal sundial that was at the Umayyad Mosque in Damascus. His sundial was made of marble, 2 m × 1 m and was engraved on the marble so that he could read the time of day in equinoctial hours for times of prayer. Also, Ibn al-Shatir made a much smaller sundial. It could be used to find the times of the midday and afternoon prayers. It could also tell him the local meridian and the direction of Mecca (http://islamsci.mcgill.ca/). The fact it took almost 600 for his work to be truly recognized is sad. Ibn al-Shatir doesn’t get some of the credit he deserves. Though Griffith University offers a scholarship named after him, for his influence of Copernicus. Ibn al-Shatir deserves his title of most distinguished Muslim astronomer of the 14th century. Deshpande, RY. “Copernicus Relied on Syrian Astronomer Ibn Al-Shatir.” Islamic Research Foundation International, Inc. N.p., 11 Mar. 2008. Web. 06 Sept. 2014. “Griffith University.” Ibn Al-Shatir PhD Scholarship -. N.p., n.d. Web. 06 Sept. 2014. <http://www.griffith.edu.au/humanities-languages/national-centre-excellence-islamic-studies/scholarships/ibn-al-shatir-phd-scholarship>. King, David A. “Ibn Al-Shatir.” Ibn Al-Shatir. <http://islamsci.mcgill.ca/RASI/BEA/Ibn_al-Shatir_BEA.htm>. Roberts, Victor. 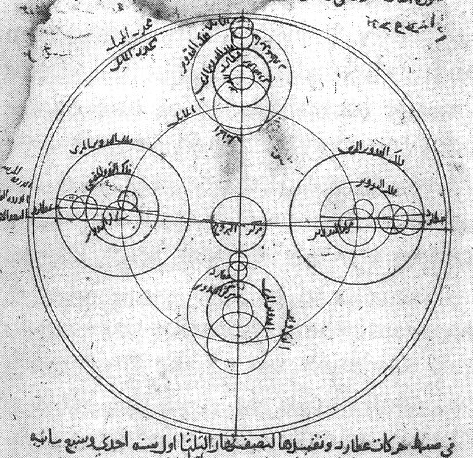 “The Planetary Theory of Ibn Al-Shatir: Latitudes of the Planets.” Isis , Vol. 57, No. 2 (Summer, 1966), pp. 208-219.